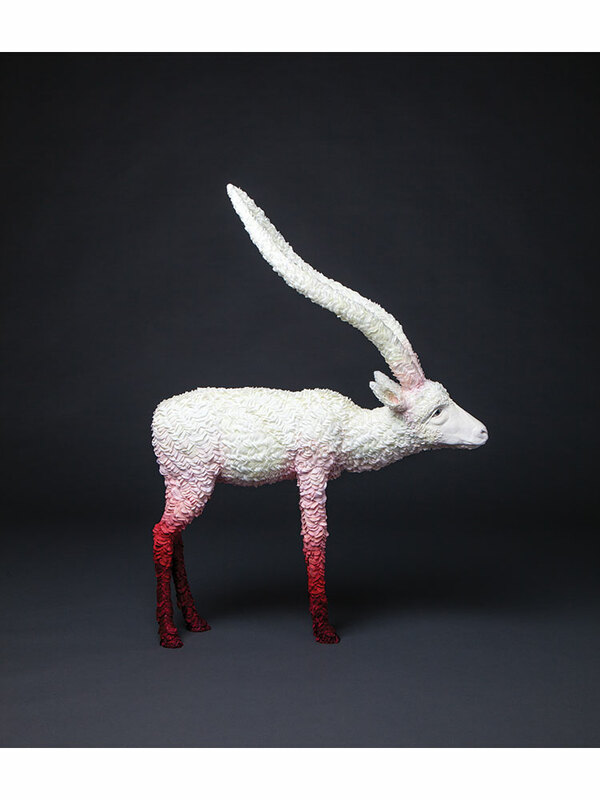 The surfaces of Lindsay Pichaske’s creatures undulate with unusual materials. 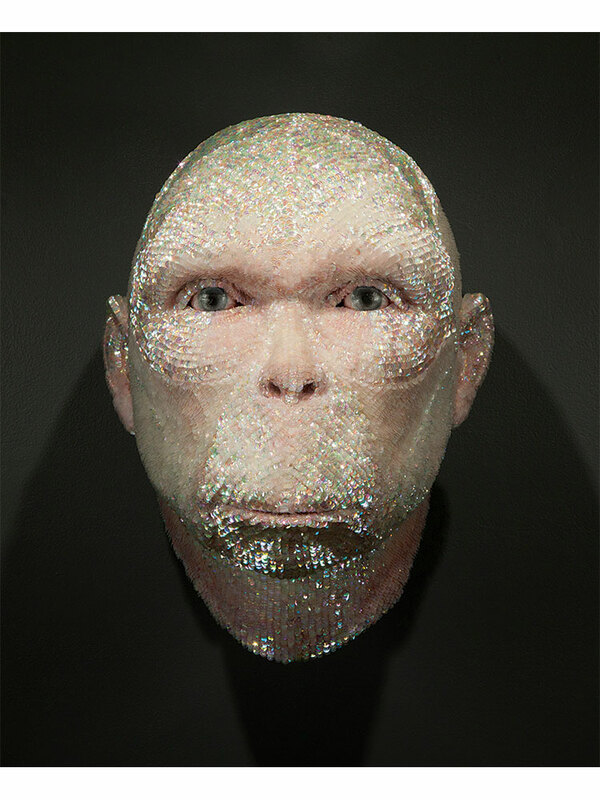 Swirling sunflower seeds form a nubby elephant hide; tens of thousands of pearlescent sequins glisten on a primate’s face. These artificial, even alien skins should, by a certain natural logic, render Pichaske’s sculptures strange, fantastical – mark them as not of this world. The surprise is that these lovingly applied surfaces lend the artist’s work an intoxicating familiarity; they draw you in, pull you closer. And before you know it, these creatures, with their carefully sculpted faces and gleaming eyes, feel real. Pichaske, 32, began experimenting with surfaces in graduate school at the University of Colorado Boulder, where she earned her MFA in ceramics. She’d visited the cadaver lab – “just one or two times,” she clarifies with a small laugh. “I was drawn to the way that they would peel back the skin – not to get too morbid – and the muscle striations were the most gorgeous patterns.” After one visit, she returned to her studio, where she had a few potato-like sculptures sitting around, experiments in how basic a form she could make that still had some kind of life-like presence. She began wrapping one in pink embroidery floss, recreating musculature. Her work today, of course, has grown into a far more complex undertaking. 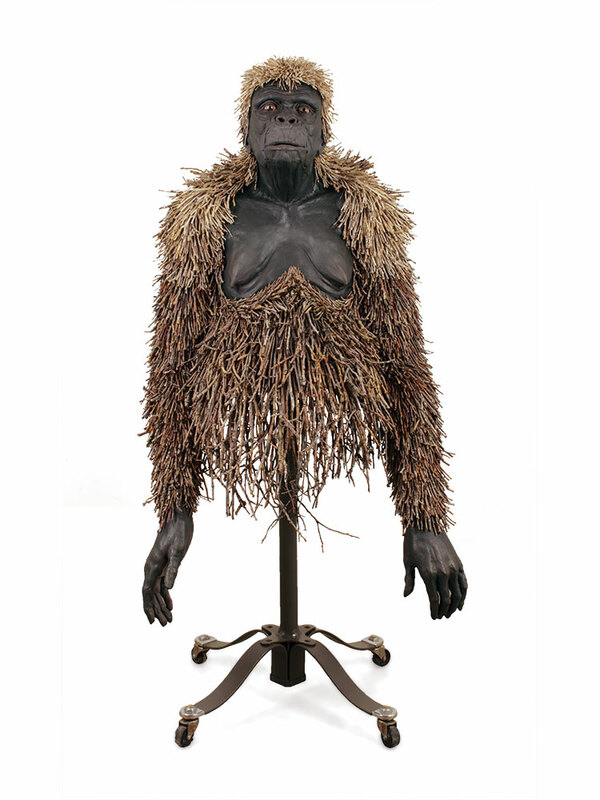 Darwin’s Muse (2012) is a 2-foot head based on a great ape, his pale skin made luminous with 26,190 sequins. Pichaske created him – meet the primate’s level gaze, and it’s impossible to remember he’s technically an “it,” an object – during a residency at the Archie Bray Foundation for the Ceramic Arts. She was standing on cinder blocks, painstakingly applying sequins and adhesive, her neck aching from the weight of a heavy respirator, when a visitor walked past, surveyed the scene, and asked the perhaps obvious question: Why? 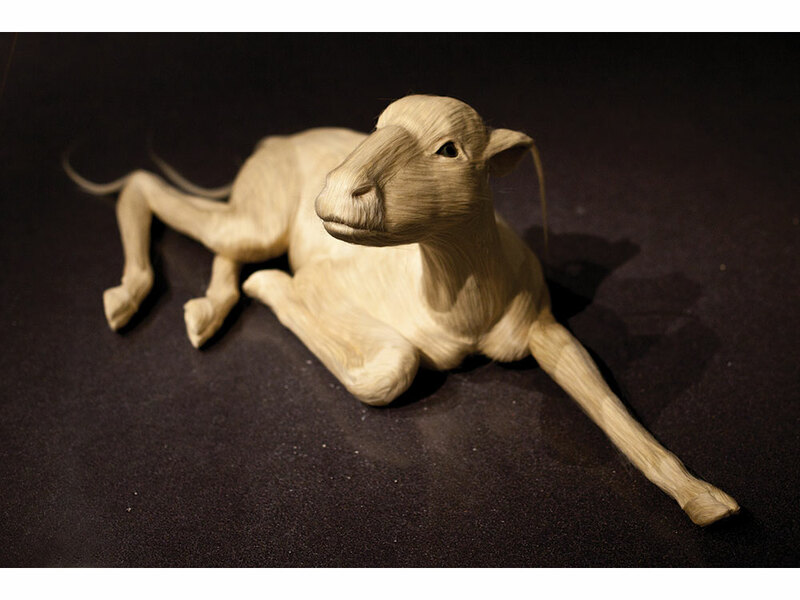 Pichaske’s connection with her creatures begins in the sculpting process. Lately, she says, she’s been starting with maquettes, an inch or two in scale. “It’s almost like a poem or a brainstorm before I start.” With a rough idea of color, covering, and form, she often allows the exact species to evolve along the way; sometimes the result blends two or more. That said, she notes, she’s always been interested in great apes and other primates. Growing up, “I wanted to be Dian Fossey and Jane Goodall,” Pichaske says. 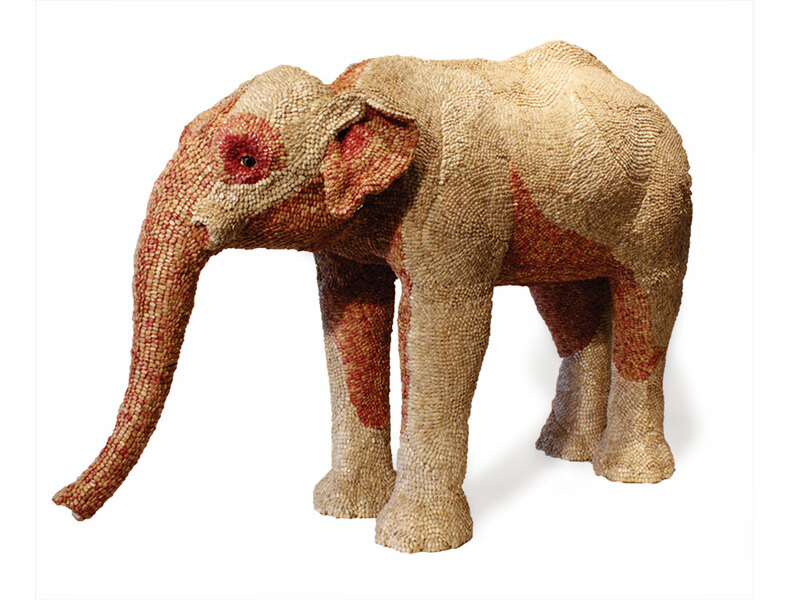 As an undergraduate, she came within one class of a biology major – but ultimately chose art. It was a junior-year class in figure sculpting in Italy that got her hooked on clay, she says: the way the malleable material mimics body and flesh, how handling it is as much about feeling as seeing. In July, Pichaske, who is a 2013 NCECA Emerging Artist, had her first solo show at Foster/White Gallery in Seattle. 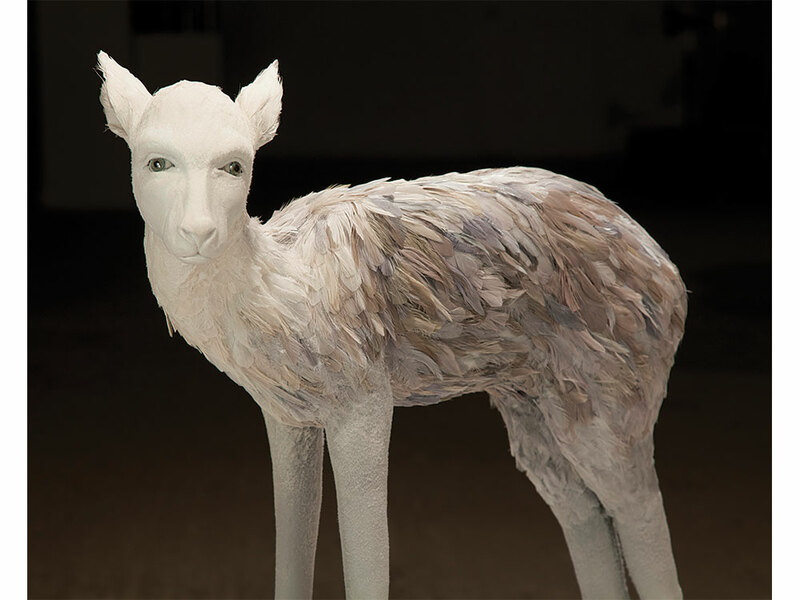 She showed eight pieces, including some of her newest work such as a giant aurochs head, lying on its side and coated in black sand, and a Japanese snow monkey, covered in silky, translucent monofilament. “Materials give the figure its identity,” Pichaske says. She’ll often spend weeks searching for ones that match the idea she had in mind at the maquette stage, experimenting with them to see what patterns and “rules” they make for themselves in use. The way a sculpture can become a being. Julie K. Hanus is American Craft’s senior editor. Ariele Alasko uses waste wood from old Brooklyn buildings in her geometric works.